For a few weeks now I've been paying a lot less attention to calories and dieting and not stressing over what I eat or don't eat. That doesn't mean I've been letting myself go though. I want to lose these last few pounds via healthy life habits. But I knew I was lacking balance and it was making me binge on junk. It's been very refreshing to not track every calorie or point. To not beat myself up if I eat a bowl of ice cream or yummy Mexican food. Recently, I've been trying to incorporate more protein into my diet. Someone close to me lost those last baby pounds with the Belly Fat Cure and is maintaining her loss by following the same concept most of the time. Because I don't have quite that discipline and because I run so much, I didn't think that diet was a good choice for me. In fact I did try it for a few days I ended up feeling like complete junk. Maybe it was detox. I also liked the basic concepts in Master Your Metabolism by Jillian Michaels. Her diet suggestion is pretty protein-rich also, but incorporates whole grains and some fruits and vegetables also. There is a great meal plan in the book. For each meal there are several items listed to start with, and then you choose one other item to compliment it. I made several photocopies and I have one at work, one in my purse, another in a kitchen cupboard. For the most part I've been trying to utilize Jillian's plan. There are enough foods on the list that I like that make it not too hard. Protein is not my favorite thing to eat. I do like eating it some. My husband grills great chicken and steak and we also love carne asada. But when it comes to other meals, I will usually choose other items first. However, like all the books say, I'm find that a protein-rich diet really decreases my appetite. And my waistline. I'm not doing the Atkins style--tons of bacon, eggs, butter and fatty proteins. Here are some examples of what I'm eating. I almost always have coffee with cream and sugar though. A girl can't give up everything! Snacks are cheese, tortilla chips, apples, berries, nuts. Jillian wants you to avoid any carbs at dinner because it's supposed to be better for fat burn during the night. I'm not usually perfect here, but I try! Most every day I eat something that isn't on the plan, whether it's a candy bar or No Pudge Brownie. In my opinion, Jillian's plan is a bit low on calories for someone who exercises a lot. So far I haven't been too successful in following this plan for multiple days in a row. Right now, I'm waiting for payday so I can go shopping because we have no meat or eggs. Well, if I really wanted to go buy some I could, but I've just been waiting. But for me, this has been a huge step in the right direction. Give it a try! Even if you simply add protein to your diet (especially the first part of the day) you may find yourself with less of an appetite and craving less sugar. Now, not WANTING to eat it, that's a whole other topic. Because often my head and taste buds tell me I want something sweet. But it's not my body craving it like it was and that's a good thing. p.s. I don't want to share it in a public forum, but if you know me and can email me--I'll send you a copy of the basic meal plan from Jillian's book. If you don't know me...just check it out from your library. Much easier than buying it! 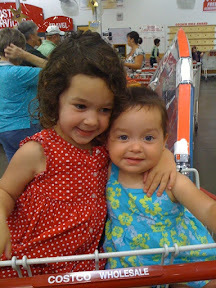 But I LOVE having my two little ones side by side in a shopping cart. My heart just overflows with joy. Joy that I am a mom. Joy that these beauties are mine. Joy that they are so cute interacting together. Can you stand it? Part of me always kind of wanted twins. These two, 22 months apart is as close as I'm going to get though! It's harder to snap pictures of, but I also love seeing my oldest nurture and care for her sisters, especially the baby. And there are moments I'm not as available and the baby is quite content to sit with her sister and be comforted. And the love the baby shows for her big sisters, melts me all over again. 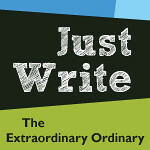 Although sometimes I want to change my blog name again, we truly are a circus. My sister stopped by for a short time this weekend and our circus status is never quite as glaring as when an "outsider" visits. We get used to the chaos, but fresh eyes see it in a new way. Here's your ticket to some recent happenings. Remember when Lily threw her first tantrum? She hasn't trantrumed like that since, although she's getting a bit sassy with her sisters. Usually they are invading her space or taking a toy from her and she's starting to assert her will. "No" is one of her most frequently used words. Although the "o" sound is usually very faint and it's just a long "nnnnnn". Lily also likes to give us a big "thbbbbt" (what the heck is that called, by the way?? ), a move she learned from her big sister Gracie. When I say or do something she doesn't like, she'll look right at me and "thbbbt". It's lovely. Now that I figured out how to upload videos to the blog, here is a little more from that day. Now that Lily can walk, she's been allowed back to Tumbling. She's pretty content to walk partway to the mat, and then will come back when called. She walked about a week after the first Tumbling incident. One of my friends commented that perhaps she started walking just so she could join Tumbling. Miss Rose, well she may not be invited back. She came with me for the first time this past week and felt the need to demonstrate her ability to do a bridge, while wearing a skirt. A skill she also demonstrated to her aunt, in the middle of the sidewalk, while we were on a walk. Again, wearing a skirt. She's such a tomboy, I'm always thrilled when she decides to dress "girly." I guess we will need to have some more lessons on modesty. And laying down on a sidewalk covered with leaves too. Oh, and Gracie? She untied my dress on Sunday morning as we were leaving the Children's building. Lily was in one hand and my other hand was full of stuff. Luckily the tie was just for looks and not crucial to my staying clothed. It would have been more trouble to tie it again, so I just decided to roll with it. Gracie thought it was such fun to hang onto the strings and basically drive me like a pony. As I walked across the front of the church entrance, as everyone was leaving. I'm sure we were a sight to behold. I'm telling you, it's a circus around here! Fit Friday, Sunday, whatever day! I don't seem to be getting my Fit Friday posts done in time for Friday. But I decided to just post it anyways. Maybe next week we will be back on schedule. Today it's some random thoughts I've had on recent runs. I almost always run up a hill or incline. My pace often slows down, but I figure it's still faster than if I decided to walk it. If I'm feeling very winded at the top of a hill, that's when I'll choose to walk for 30 seconds or so. Is that weird? I feel like most people probably do the opposite. But that's how my brain works--or what keeps me motivated. This evening I was running a 4 mile route where the entire second mile is an incline. It's not too steep, but running a mile uphill gets tiring. Each time I would find myself slowing down, I would choose a landmark ahead of me and pick up the pace until I get to it. Speaking of picking up the pace, sometimes I find myself running too fast. Or I'm getting too fatigued and I need a bit of a breather. It happened tonight as I was running the third mile down that same slope, and again during the fourth mile as I was pressing in to get home. Sure the first instinct is to take a walk break. But I also find that if I lengthen my stride, it slows me down and I can breathe more deeply and I get the rest I need. If I want to pick up my pace again, I'll shorten my stride and my knees drive a bit higher. A new goal or self-challenge can give you new motivation. Sometimes I find myself wanting to skip shorter runs (I'm trying to follow some training schedules right now) because they have become routine. I am blessed to live in an area that I can get 3-5 miles from outside my front door. But I usually run the same route or two. I've been running with my neighbor some and she likes a route I haven't done much--the one with the 1 mile incline. We ran it last week and I realized I need to do it more often, because it's a new challenge. My neighbor likes it because it's along two main streets in our area. I tend to run more neighborhood streets, but I think that's because I know them since I lived in this area for 10 years prior. So when I headed out this evening, I decided to do the different route and it was a nice change. That 1 mile incline definitely challenges me in a new way, and I like it. My average pace was up about 15 seconds. So of course I'm going to try to shave that down in runs to come. Finally today, when you run can make a huge difference. A morning run after a good nights sleep is my favorite. I'm strong, awake, vibrant and full of energy (once I get going that is!). But a morning run isn't always an option for me, sometimes because I just can't get myself out of bed. Sundays are a long day for me. I'm at work by 7:30am and I spend time walking and being on my feet. We went to an afternoon birthday party and I ran when we got home while Bean prepared dinner. (Yes, he's the MAN!) I felt rather blah. I was tired before I even left, but I knew I'd still be happy I ran even if I didn't feel my best. So, if you've had a long day and go for a run, don't be surprised if your performance isn't great. Try to get in at least one morning run a week, even if it means "early to bed, early to rise." During the summer, I can wake at 6am and run before Bean leaves for work. Once the school year starts again, I'll have to get up at 5:30am to run on a workday. I logged about 12 miles in the last 7 days. Hoping for a few more than that next week. I am often plagued by self-imposed guilt. I'm an overachiever and a people pleaser. My life is held in a very precarious balance. When any little thing upsets that balance, my guilt usually increases. When I'm going to work, I feel guilty for not being there with my kids. When the balance has to swing towards my kids, I feel guilty for not being at work. I feel guilty that Bean often makes dinner and does clean-up while I am with the kids. Granted, he prefers to do that, and he knows how much I need that time to reconnect with the kids after a day at work. I feel guilty when Bean sends me out for a run, because he rarely takes me up on similar offers. I feel guilty when I take a slow day and don't get much cleaning or laundry done. Since Lily was running a low grade fever last night (she's still asleep, so not sure how she is doing this morning) she needs to be home. My job is more flexible and I can do things from home, so when it's possible, I usually stay home. Bean is more than willing to stay home as needed (and he did last week). Last night I was letting the guilt overtake me. Guilt for not being in the office. Guilt for another "odd" week. Last week my mother-in-law was sick so I stayed home on Monday and went to work on Thursday instead. A change in my routine, in that precarious balance, isn't my favorite. No matter what though, my family always comes first. And I remind myself that ultimately, I work for God. I minister to his people through my vocation. God knows when my children will be sick. God knows what responsibilities I have at work. So I need to do a better job of trusting him and his infinite wisdom and not letting guilt consume me. As the guilt was drowning me and my soul reached out to God to save me, I simply heard the word: embrace. Embrace what the day holds. Embrace the opportunity to cuddle my baby. Embrace a slower morning. Embrace an extra day with the kids. Certainly I'll be checking in with work and doing some preparation during naptime. But this is the day the Lord made, and I need to embrace it. What challenges are you fighting against that you can embrace today? Perhaps my memory is foggy. It does seem at times that my mind is wiped of past difficulties and challenges and what is the present is harder than what I remember. Am I making sense here? I don't think I am. My point is, I could be wrong, and I probably am, but I would say that last night was the worst night with a sick child, of my mothering career, which is just 6 1/2 years long. I have been blessed with children who are good sleepers. Well, they become good sleepers. I read some books, talked to some friends and tried to pay attention to the natural routines of my children and they became good sleepers. Naps are long and solid, and nightime sleep is at least 10 hours, sometimes even 12 hours. Even when my kids are sick, they are good sleepers. Sure they wake up more and need more comforting and sometimes medication for their ailment. But they go back to sleep and I don't lose much sleep. Lily came down with a sudden fever in the evening. No prior sign of illness. I guess she woke from her nap a bit lethargic and my mother-in-law gave her some Motrin. When we got home, she was pretty clingy and very fussy. By 6:15pm, she was dozing off on Bean's lap. VERY out of the ordinary for her. I tried putting her down to bed a few times, but it didn't last long before she was crying. Even with Motrin on board, her fever still raged. At points I think it was above 104. Finally I just went to bed and brought her with me, but the fever made her so miserable she couldn't sleep more than about 20 minutes at time. We spent time walking around the house and sitting on the couch. I did get to doze off with her several times when we were laying in bed, but it was never for long. At some point Gracie came in our room crying, although it was hard to figure out why, and Bean went and laid with her for a while. Finally sometime between 3 and 4am I was able to give Lily her next dose of Motrin and she slept in her crib until about 8:30am. That 4ish hours of sleep was much needed by me, but I woke up such a zombie. It felt a bit like the Twilight Zone. Did that really just happen? Was I basically awake with a sick baby for 5 hours last night? Lily is doing much better today. Her fever is only running abound 101 and she's a bit more lively, although still clingy and fussy. It was definitely a night to remember. One I pray won't be repeated any time soon. Although Lily is crying in her bed right now, so I need to go check on her. She's napped well today, so I hope she'll sleep good tonight. Mama is toast! I worked about a half day today, and had to actually use my brain and interact meaningfully with my co-workers. Quite a challenge! But Starbucks helped immensely with that. Off to check the baby. I'm a little bit exited that I can upload video here without using a hosting site. I just figured this out, thanks to a quick question to my best friend Google. So, after 17 months and 17 days, little miss Lily Cate finally decided to walk. And by finally decided to walk, I mean she decided to show us the walking skills she has obviously had and been honing for a few months now. Because she is no beginner. Perhaps she would walk independantly when we were out of the room. I don't know. But she is sure good already. On July 4th she took 2 steps from me to a couch. Of course we tried to get a repeat all evening, but it never happened. Yesterday I was told she took a couple tiny steps at Grandma's. Last night I was putting the older girls in the car to get some frozen yogurt. Bean came running outside to tell Lily took 5 steps. We were gone for about 40minutes. And when we got home, Lily walked across half a room to greet me. Seriously. This video is from just a little later that night. It certainly doesn't look like a child who just took their first steps only 90 minutes prior. But my kids don't go with the flow. They march to the beat of their own drummer. Lily is no different. There is lots of excitement up in this house. The girls love trying to get Lily to walk. Which means they are up in her face ALL the time. She was still crawling today, but every now and then she'd get brave and walk. And of course if I encouraged her to walk, she was all about it. My back is very excited. Of course it will be a bit before she's completely independant. But we are one step closer. AND I don't have to be grilled at our next doctor appointment about her lack of walking. I wonder what other skills Lily is working on in secret. Maybe something that will make us independantly wealthy? One can hope. Cause we would support a lot of cool ministries with that independant wealth and buy houses for our family and friends. So, keep it up Lily. Surprise us! It's been a few weeks since my last Fit Friday post. I'm excited that two good friends (who don't know each other) are slowly becoming addicted to running. It's not that I think everyone should be a runner. But I do think there are huge benefits both physically and mentally to having some sort of outlet. If your body can handle it, I happen to think that running is one of the most easy activities to take up. Sure you have to start slow and build, but if you find some plans and stick to them--you will find yourself running, and loving it. On to our topics for today. For many years I've had various fitness magazine subscriptions, depending on when I could get one for $10 or less. I've received Self, Fitness, & Shape. I thought that I was encouraging health and fitness in myself by reading these magazines, as well as enjoying little tips, tidbits and product suggestions. In some ways, I think I was. There were times I was inspired by various articles and stories featured in the magazines. Over the last few months though, it seemed that reading these magazines only made me more dissatisfied with my body and my life. Especially when reading about how celebrities stay in shape. You know, those people who can afford gym memberships or have a home gym, have a nanny to watch the baby while they exercise and of course the celebrity trainer that provides all the tips and tricks. I know they give plenty of time to stay fit, and I applaud that. I just also recognize that they have a lot more means to do so than the average reader. Because I workout either in my house, or in the streets, a lot of the information wasn't relevant to me. Even after reading 4,345 articles about how to have flat abs, I still don't. And usually the routines were just silly or required equipment I don't have. Sure there are great recipes and food tips. But they usually don't include how to make such recipes edible to your young children. So, I'm done with the magazines. I'm very happy with Jillian Michaels, my Nike's and the free Exercise TV workouts I have through my cable. I can get whatever results I want with them. I don't need your fancy magazine. I don't need to compare myself to your airbrushed models and privileged celebrities. I'll stick with the real world. My new favorite magazine? Runner's World. Because it's all about being the best runner you can be. It's not about getting your body to look a certain way. It's about training your body to achieve a goal. Sure, I can't necessarily run the 20+ miles a week many runners featured do. But one day, when my kids are older, I believe that I will. It's about the love of running. And I'm all about that. Our other topic (it's quick, I promise) for today is: sprints. Working sprints into your runs will make a big overall difference in your athetic ability and your mental confidence. There are fancy plans and ways to run spritnts, but I haven't even quite gotten to that place yet. Here's the two ways to incorporate sprints into any run. 1. When you are going at an easy pace, choose an object in your view (a particular car, the end of a block, a bend in the road) and run as fast as you can to it. You can also sprint for part of a song (like one verse or one chorus) if you are listening to music. Try to do this a few times during a run. 2. Sprint at the end. I almost always try and sprint the last 30-45 seconds of my run. As in go all out. Sometimes I'll even push myself a bit past my "ending point" just to show myself I can. I'd love to hear any fit tips you have or your fitness triumphs this week! See the cute little girl in purple on the far left? That's Gracie, enjoying her first tumbling class. A local rec center offers a tumbling class for toddlers that's pretty affordable. Gracie is active, but it remains to be seen if she will be as sports-minded as Miss Rose. We definitely intend to put her in sports in a year or two. But we knew she would enjoy this 4-week tumbling class. She was very cute to watch and participated in everything. That's Lily, throwing her first bonafide tantrum. Boy was she MAD that she couldn't join in on the fun. She spent the entire 45-minutes trying to crawl across the gym to the tumbling mat. She squirmed like she hasn't ever squirmed before in my arms. And she cried, and she fussed and she whined and she screamed. I kept having to walk out into a hallway to calm her down. But Gracie wanted to see that I was there watching her, so I couldn't leave for long. At one point I let Lily squirm down to the ground. She looked at me, waved and said "bye bye," then turned to crawl to the mat. Towards the end, I finally gave up and would let her crawl away a short distance before calling her back. Or if she didn't come back, I'd run out to grab her. And if she noticed Gracie she'd wave like crazy saying "hi hi hi." I have some video I took on the camera. I may try to upload it to share later this week. I don't think Lily is going back to tumbling. I am pretty sure I just completed my best run ever! I didn't set out to break any records or log a personal best. It just happened. Tonight I ran 5 miles in 45:17, which translates to a 9:02 average pace. Thus far, my fastest average pace for up to 6 miles has been about 9:15. I never feel great my first 1-2 miles. But then I seem to find my groove and start plugging along. I knew I was pushing myself a bit and every so often I would ease up a bit, but then I just felt like getting right back to it. So I did. I left the house around 7:30pm, so the sun was setting and it was cooling off. Once I worked up a good sweat I was the perfect temperature. I ate fairly well today, plenty of protein which I'm finding is crucial to my body. I took care to hydrate well all day. Usually at the end of the run, I feel like I have more gas, that I could push it a bit further. I almost always sprint the last several hundred feet of a run. Tonight, as I was sprinting to the end my legs felt like they were going to fall off and my lungs were burning. I really had to push until that lovely Nike+ voice told me I was done. Oh was I ever happy to hear her! I learned tonight that I can push myself a bit harder, that I need to when I'm looking for a good workout. I learned I am capable of more. I don't know why, but I love shaving just a few seconds off my times. A lot of training schedules call for "easy" runs. I'm not too good at easy runs. Even when I try for an "easy" run, I still end up pushing myself. Because I like it. I have been running for about 5 years now. I love it more every day. My birthday was a few weeks ago. Perhaps one of the best gifts I received that day was this post on my Facebook wall. Happy birthday. I'm so glad you were born. Because, if you would not have been, who knows where I'd be today? I never even heard of God until I met you when I was a little girl. My life could've taken a WHOLE different path. Love you, girl! This was written by my friend Leah. We were neighbors when I was in 4th, 5th and 6th grade. She was one year younger than me. Our brothers had the same name and the four of us played together a lot. They had two younger sisters, just like we did too. It was probably the summer after 4th grade and a small church down the street was having a Vacation Bible School. I don't remember why my mom sent us, or if we asked to go. But we invited our neighbor friends. It was safer then, and even though we had to travel about a quarter of a mile on a busy street, we walked to and from VBS each day for a week. Maybe my mom walked with us some, maybe we were driven some, but I definitely remember the four of us walking alone also. Leah accepted Jesus as her Savior for the first time that week. I think we all went back to the same VBS the next summer too. We moved away, and then Leah moved to another state with her family. We kept up through letters. Her family got involved in church in her new state. Her faith continued into college, where we could now keep in touch via our college email addresses. Then we graduated and lost contact. Maybe a year ago or so she came to mind and I searched her name on Facebook, and of course I found her! Leah is married, has three young children and is a working mom like me. She still loves and serves Jesus. She hasn't been back to California since moving, but I hope one day we will see each other again. This is what it's about. I was just a young girl, not afraid to share my Jesus. Not afraid to invite my neighbor to VBS with me, at a random church down the street. And she came. And her life was forever changed. I was just a vessel. My question today is, am I raising my own children this way? Am I instilling Jesus in their hearts and lives? Is church a privilege? One of their favorite places to be? Or will I one day use it as a punishment? Will I not listen to their wishes about a church and place my own in higher priority. One of the best gifts my parents gave me was the gift of a church. A church that was home. And even when their preferences changed, they recognized the value to their children. And so we stayed. I hope I raise my children to have a lot of Leah's in their lives. I've come to a conclusion this week. It's time to make peace with my body. I will no longer give mental energy to my body's shape and size. I will no longer over-critique it, criticize it and obsess over changing it. The nagging few pounds and muffin top won't run my thoughts or ruin my day. I won't stress over numbers. On clothing tags, on the scale, on nutritional panels. I will stop comparing myself to others, because I always come up lacking. If I want to enjoy food, I will. If I want to follow an eating plan, I will. But I won't beat myself up if I don't stay on it. I will learn to love myself, the way I am, even if I am slowly working towards permananet changes. I am who I am. This is me. Sure I'd like to see a few changes, but I'd rather them be slow and purposeful and part of a whole way of life, instead of drastic and short term. I'm an emotional eater and often when it comes to sugar and carbs, somewhat of a binge eater. Which is why I've been losing and gaining these last five pounds for months now. I deprive myself, and something puts me over the edge and I over-indulge. So I'm making a peace treaty with my body. I'm just going to live life, in the healthiest, most balanced way that I can. And maybe by the end of the year, I will have achieved and maintained my goals. Now, I'm going to go eat some cake. When all else fails, share photos. Does it hold up? Are you distracted by these photos enough to not mention the infrequency of my posting? I definitely blog in clusters these days. And I'm clearly not in one right now. There are blogs writing themselves in my head and a few titles saved in my drafts to remind me. But they will have to wait on summer, and life I guess. We're having lots of fun and doing all sorts of "summery" things. Like being buried in the sand by our cousin. Miss Rose is actually standing up under the sand. She's also wearing an old pair of my sunglasses. Lily is getting so grown up, sometimes. The other morning she sat on the couch, drank her sippy and ate dry cereal out of a bowl for about 30 minutes. Miss Rose was sitting there too, but she got up when I took this photo I guess. It was so heartwarming to see my three girls enjoying the slow morning together. Lily is still not walking, which is really becoming a pain in the back. I know it may sound facetious, but it really isn't. Can I share the rundown? It may sound like I'm complaining. And I kind of am. Although I still wouldn't change it for the world. Here is what my back has been through. And of course, even while pregnant with Lily and beyond, I've still carried Gracie plenty. 48 months friends. Of pregnancy or carrying a non-walking baby. 4 years worth. This is also why mother's bodies begin to break down. And finally tonight, some patriotism. I love dressing in patriotic colors on the 4th of July. 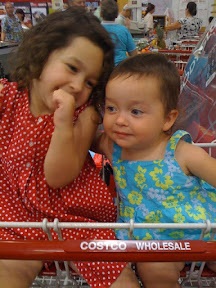 I picked out clothes for the little girls, and then Miss Rose wanted to follow suit and chose her own clothes. This is pretty typical. Miss Rose is not a huge fan of dressing up and we have enough battles right now, making her dress up for church just isn't one to fight. Lovely wallpaper and hanging picture in our church office, huh? I even had different clothes for me and the little girls (still patriotic of course) for later in the late. I'll share those later. For some reason, today was a really rough day. For every reason, and no reason at all. You know? They happen to all of us. Sometimes, I feel guilty when I'm in a bad mood and am mad at the day. I know many have it rougher than we do. But even when life is good, even when you are blessed, you can still have a horrendous day. It's one ONE day though. And tomorrow is a new one. And Jesus is on the throne no matter what. So I'm going to take my crabby self to bed. Because sleep and the mercies of the Lord, which are new every morning, are the only cure. I am praying I also have mercy for myself in the morning too. I can't seem to muster the mental energy for a true blog post. As I am getting out of the van and need to unload the kids I always hit buttons to open the side doors automatically. This morning, as the doors were opening in the Target parking lot I heard a crash--indicating Lily thought it was fun to drop or throw her sippy cup down. I went to the door and looked around under the van and car next to us, but couldn't find it. I thought perhaps I mis-identified the noise and began to look in the van for the cup. Lily then began her customary "uh-uh-uh" sound and was pointing out beyond the cars next to us. I looked where she was pointing and sure enough, there was the sippy cup rolling halfway down the parking lot. She's a smart one folks! She may not walk, but she knew what I was looking for and found it for me. Little stinker! Today, I brought the last of my baby items to a crisis pregnancy center. I usually sell a lot of my items, but these were good items that probably wouldn't sell for much and would be much more useful to someone in need--like Born Free bottles, changing table covers, assorted clothes and my cherished breast pump and pumping supplies. It felt good to donate it. While we were at the crisis center, Miss Rose said to me, "why aren't you selling this stuff so you can get money?" I guess my ebaying and craigslisting habits have rubbed off a bit on her. Apparently I need to emphasize blessing those in need as well. And, a lady at the crisis center asked me if Lily was 9 months old. Um, she's almost twice that age, and is average-sized for her age. Kinda surprising from a woman who probably sees babies all day! I have lived for Jesus my whole life. I have been a minister of his word for almost 10 years now. You'd think I would have a lot of things figured out. But I am reminded again and again, I don't. And that's how God likes it. Sometimes as Christians, we think we should reach this place of "nirvana". A point in life where we have it pretty much figured out. We love God, we love our neighbors and we love ourselves and things in life go smoothly. But Jesus told his disciples, "in this world you will have trouble." If you look at the life of Paul, his trials never stopped. And he rejoiced in them. So instead of beating ourselves up, instead of feeling like we've done something wrong, instead of feeling like we have failed, we must learn to embrace the trials and tests of faith. They serve as a mark of growth. A reminder to rely completely and wholly on God. A sign that we must continue to surrender to our Maker. As I pray and watch and wait over situations and circumstances in my life and the lives of family and friends, I remind myself this is how it's supposed to be. It signifies growth. I read a timely word this morning. Onc which I will be emailing a few friends today, and would like to share with you also. He speaks and it is done. The mighty Lord! Revealing joys the darkness of night did hide. From Streams in the Desert.